Sometimes humour and parody are the most effective way to communicate. Milo turns this wannabe follower of the ‘prophet’ inside out. Join us and help stop the Islamisation of Australia. Controversial commentator Milo Yiannopoulos says he is in Australia to deliver a “sort of warning from America”, as he called on a small number of conservative politicians to “start fighting” against the left. The event, hosted by Liberal Democrat senator David Leyonhjelm, was attended by Pauline Hanson’s One Nation party, including former Queensland senator Malcolm Roberts, as well as Nationals MP George Christensen and Liberal MP Craig Kelly. Senator Leyonhjelm acknowledged Mr Yiannopoulos, wearing sunglasses and apparently Gucci, was largely speaking to “friends” in the room as the “alt-right” figure spoke against identity politics, feminism, Muslims, the Left, universities and the establishment. He also criticised violent protests outside his event in Melbourne last night that saw “offensive behaviour” from both left and right demonstrators. Did you get that? That ratbastard Roz Ward is just as “controversial” as Milo. The journaille is despicable. “I came to Australia as a sort of warning from America, I came to Australia to try to implore you not to go down the path America’s just gone down,” Mr Yiannopoulos said in one of parliament’s private dining rooms. “Last night in Melbourne I think the Left showed us who they are, they demonstrated us that those wars are already here. The problem is conservatives and libertarians don’t realise it and haven’t started fighting yet. You need to start fighting, and you need to start fighting fire with fire. “You need to reject identity politics and you need to reject political correctness if you want to save your country and save western civilisation, you need to reject all of the tenets that the progressive left is attempting to establish in culture, and that includes from journalists, from the academy, from the entertainment industry, they’re all complicit in this. 1/ British alt-right commentator Milo Yiannopoulos. Picture: AAP. 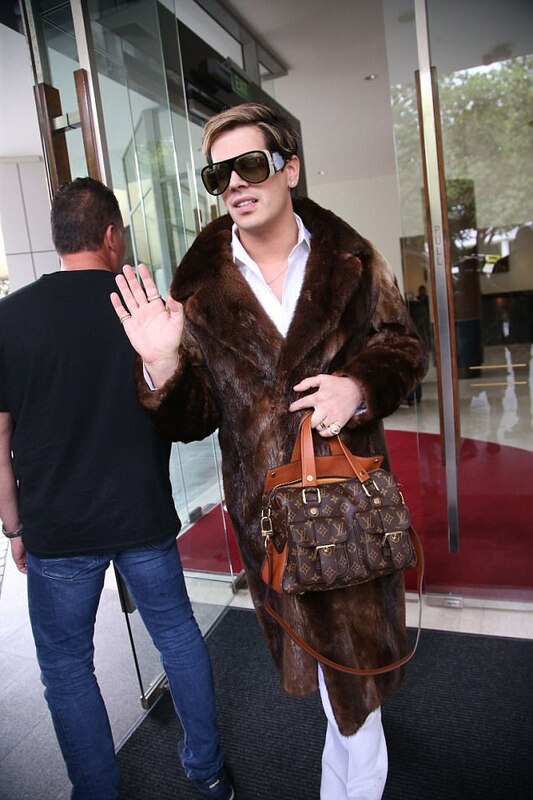 Right-wing firebrand Milo Yiannopoulos has been pictured wearing a thick fur coat in 34C heat as he heads out shopping in Perth. The self-described provocateur touched down in Perth on Saturday, the second leg of his Troll Academy Tour. Mr Yiannopoulas, 33, has come under fire from various community groups for offending Muslims and gay people, despite being gay himself, since his tour of Australia began on Friday. Stepping out in a thick fur jacket on Sunday, Mr Yiannopoulas appeared not bothered his choice of clothing might continue to offend various groups in the community. Taking to his Facebook on Sunday, Mr Yiannopoulas told his two and a half million followers he was ‘keeping it low-key’. His loyal followers praised him for his bold choices. ‘I can’t help but admire you and your willingness to cause controversy for the better cause of humanity,’ one man said. While some took issue with his fur coat, hoping it was ‘faux fur’, others were more taken aback he wore the jacket in Perth’s 34C heat. ‘You must be sweltering in that fur in the Perth heat, darling!’ one woman said. ‘That fur is just for show Milo, it’s bloody hot today!’ another said. Just three days into Mr Yiannopoulas’ Australian tour, the details of his altra-extravagant life-style and upbringing have surfaced. Mr Yiannopoulos insisted he was a self made man, despite growing up with a ‘mafioso’ father and living between houses all around the world. He was born Milo Hanrahan and raised in Kent, England to Greek and Jewish parents. His family had a chalet in the Austrian Alps and for his fifth birthday he got a pony. It was a lifestyle any child would be in envy of – but that’s nothing compared to today. Now known as Milo Yiannopoulos, the controversy king wears labels like Versace and Gucci, has houses around the world, stays in fancy hotels and only drinks expensive champagne. Put simply, he’s living life like a rockstar. 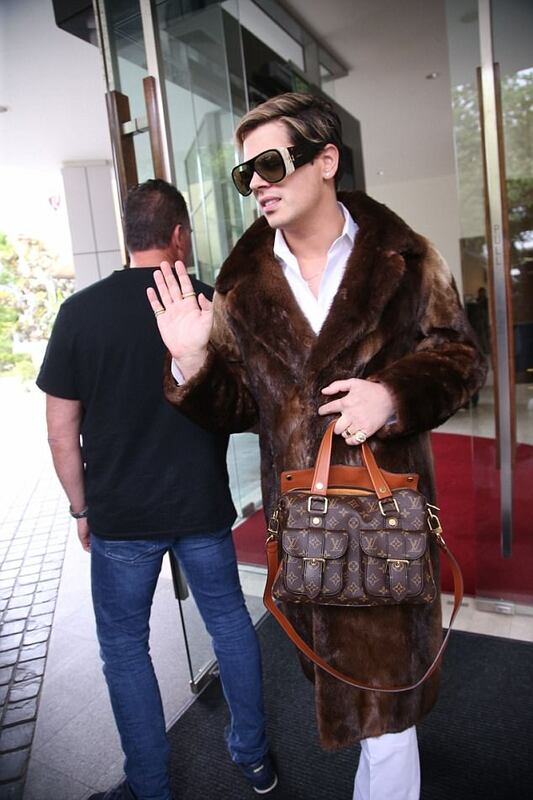 And after flaunting the best of his expensive wardrobe during his visit to Sydney this week, Yiannopoulos told Daily Mail Australia he was offended by estimates he’s worth just AUD$5.3 million.